My grandpa died last week. I pulled these thoughts together for the funeral, and read them to a packed house. I had the whole place laughing, and I think that’s the way Grandpa would have wanted it. The words may not mean a lot to you, but for me they capture my grandpa. I remember spending summers in Kansas with Grandpa. I grew up in the suburbs of Detroit, and now I live in St. Paul and take the city bus to work everyday. Spending summers in Kansas was a bit of culture shock. I remember waking up early and sitting around the kitchen table and listening while Grandpa and my mom sipped coffee and talked. The Hutch paper was always spread across the table, and inevitably, the conversation would turn to me. “He probably fails all his classes, don’t he?” Grandpa would ask. A slow smile would spread across his aging face as his gaze shifted from my mom to me. “I don’t think so, Grandpa,” I’d respond, partially knowing he was joking, and partially wanting to prove myself. Then he’d lean back in his chair and look up at the ceiling. “No, you’re a good kid. You’re a good kid.” He’d say quietly. He’d comment on a story I’d written, the one about spies and a nuclear power plant in Libya. I was in fourth grade at the time. “That was a good story you wrote. You got that from your great-great-grandfather’s brother…” He’d go on telling me about my distant relative the author, and how that’s where my writing came from. 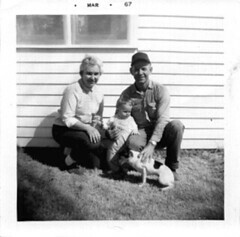 Later in the morning I’d climb into the rusty pickup with Grandpa and the sandy colored dog, Cherie. We’d drive the quarter mile through Raymond to the tiny post office to get the mail, Grandpa’s callused hand hanging out the window. Sometimes I’d wait in the truck, watching farmers come and go through town, wondering why it took so long to get the mail. Sometimes I followed Grandpa in. “Who, him? That ugly kid? Hell, I dunno,” Grandpa would respond, rubbing his chin and looking at me. “Oh, Les,” the woman said. “Yeah, him and his brother are visitin’ from De-troit. I gotta entertain the little turds for a couple of weeks.” That was Grandpa. Later we’d end up at Ike’s Windmill and Farm Supply. Grandpa would drink more coffee, smoke a Marlboro, and joke with Geno and Ike, and whoever happened to come through the door. I remember trips to the Fish Gas Station, when Grandpa would treat my brother and I to a candy bar and a pop. I still remember the taste of Pepsi in a glass bottle, and I think of sitting in the duck taped chairs in the old Fish station, listening to Grandpa trade stories with Charlie Fish and any customers who passed through. I remember trips to the Alden café, where I ordered Chicken strips and a Coke, and Grandpa would always take the leftovers home to the dog. I remember driving the tractor in circles in the field, joyful entertainment for a city boy. And I remember Grandpa teaching me to drive when I was 10, my white-knuckled hands gripping the wheel of the ’79 Ford pickup like we were going to die. Meanwhile Grandpa was pulling at his faded blue jeans, gazing off into the distance. I remember the last time Grandpa came to visit. As usual, I gave up my room for the guest and slept on the couch. But when Grandpa left and I had my room again, I wouldn’t let my mom change the sheets. They were thick with the nostalgic smell of my grandpa, and I wanted to soak it up. I’ve learned that life is not full of easy answers. With the death of my grandpa, I find myself asking questions. Not about death and why my grandpa had to die. He was an old man, and you come to expect these things. But I find myself asking why I didn’t know him better. Being the youngest grandchild, he grew too old before I grew up. One of the better eulogies I’ve found on Google.